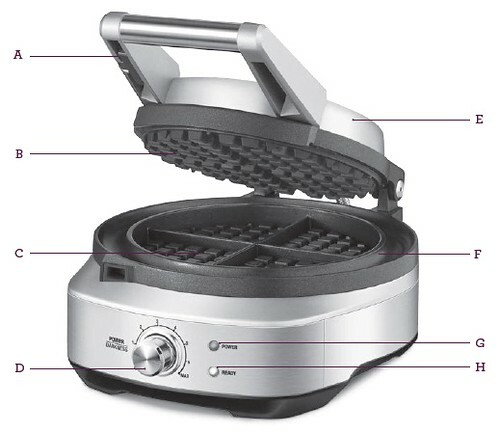 The Breville® BWM520XL No-mess Waffle™ – How do you make crispy golden waffles without the mess? 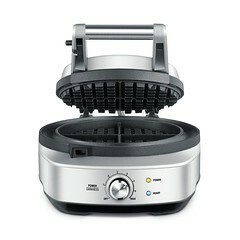 The Breville® BWM520XL No-mess Waffle™ is a classic waffle maker with a no-mess moat. The moat captures and cooks any overflow batter for easy clean up. A browning control allows the customization of your favorite waffles every time. A. Storage Locking Clip. B. Die-Case Aluminum Cooking Plates. C. PFOA-Free Non-Stick Coating. D. POWER/DARKNESS Control Dial. E. Stainless Steel Housing. F. Integrated Moat. G. POWER Light. H. READY Light. Not Shown Breville® Assist™ Plug.